So AT or MT = lots of $$$$$. Swap out the bootlace for a bungee. veitnamcam, john m, Nibblet and 1 others like this. Just a word of caution Madjon - if you've used chain from your local hardware store you might like to keep a close eye on them as they might wear quickly. You'll be pretty sad if they break and wreck your guard. looks like ordinary welded chain which is likely to pull the welds when you put the power on.try a piece tied to your wagon with a long rope and tied to a post with a weight on the rope for if it snaps then just idle away in first gear and see if the chain holds or the welds start breaking.good chain should stall your wagon . 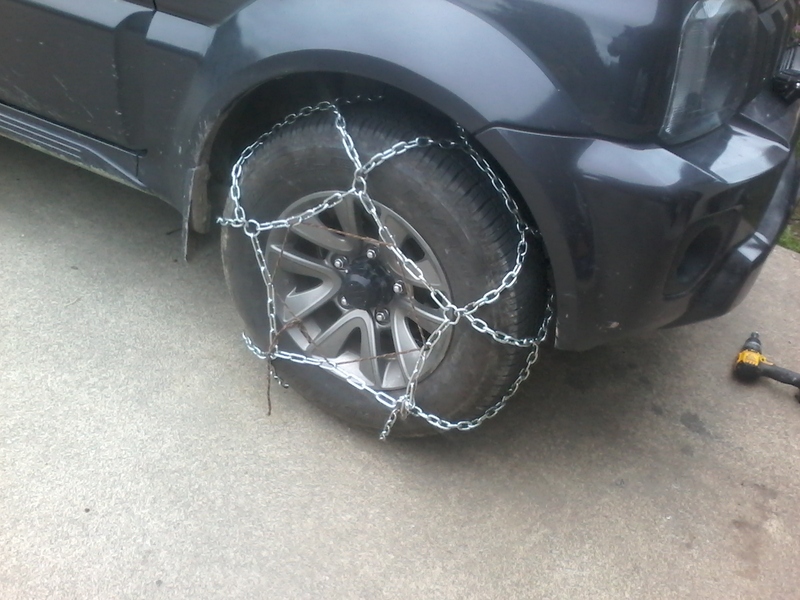 Yep, snow chains are usually manufactured from hardened steel, hence the cost. Madjon should get a few uses out of those but unfortunately the good idea might become false economy in the long run. If I was in an area where chains are needed daily I would happily pay for 2 sets of snowsweats. These are for paddock/track,or if the Lewis is marginal perhaps.